Ships from and sold by spectrumbooks. The REAL-TIME telling of caregiving experiences, for families of the 36 million people worldwide who live with dementia such as Alzheimer's. The grammatically-incorrect title in quotations is what the author's father asked while living with dementia. Learn what to expect and be comforted by this candid account of caring for a loved one. This revised and expanded second edition of the internationally selling title features more dialogue, including family, caregiving, and legal details. If you've ever raised your hands and screamed, "I don't know what to do! Someone, please tell me what to do!" You're not alone. Read this book. To be released as an eBook late 2014. "We will walk this caregiving road together," says author Brenda Avadian, MA who cared for her late father with Alzheimer's. 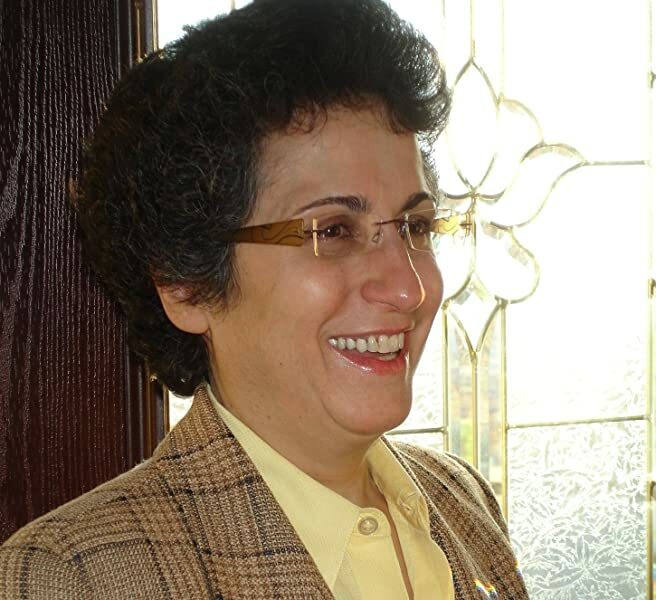 The author of nine books, she serves as a spokesperson for family and professional caregivers caring for people with dementia (such as Alzheimer's, vascular, Lewy body). 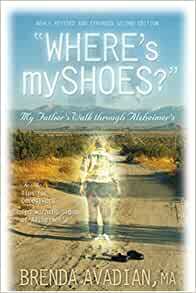 I recently finished reading "Where's My Shoes? ": My Father's Walk Through Alzheimer's and found it to be a compelling book. Author Brenda Avadian shares her personal experiences dealing with her father's Alzheimer's disease. The reader can feel the emotional rollercoaster ride that the author went through in dealing with the disease and trying to do the best thing for her father. The difficulties she experienced with the doctors, lawyers, medical facilities, government bureaucracies, and especially her own siblings are shared openly. This allows the reader to see the reality of what happens to people with Alzheimer's, and what the caregiver must face as the disease progresses. It is that openness that makes the book such a useful read. While this book deals with the specifics of Alzheimer's disease, the author's experience and insight can apply to other serious health and caregiving issues we face as our parents age. If you want to better understand the health and legal issues surrounding Alzheimer's, and the family dynamics that are involved with caregiving, then you should read this book. Since my father was diagnosed with Alzheimer's, I have bought every book I could find about the subject. After devouring each book myself, I pass it along to my mother and siblings to read. I enjoyed <Where's my Shoes> because it gives a truthful and heart-felt account of one woman's situation with her father's Alzheimer's, and shows how the disease not only affects her relationship with her father but also her relationships with her siblings, husband, friends and even her clients. Praise to Avadian for writing about her experiences. That being said (typed), I did not think this was the best account that I have read of the subject. Davidson's book <Alzheimer's: A Love Story> describes the author's experience with her husband's Alzheimers, and is much better written. It gave a much more clear description of the slow decent into Alzheimers, and is a beautiful, almost lyrical book. By all means do buy <Where's my Shoes,> but please consider reading Davidson's book first. 5.0 out of 5 starsIt is truly a small world! I had no idea that a chance meeting of a cousin's cousin at a funeral would create the opportunity to discover this wonderful book, "Where's my shoes?" I have seen almost at a distance a limited number of people who had altzheimers and only had cursory idea what the disease really was. My own personal experience with a close friend fell into disaster when I went to pay visit in the nursing home and the site of me approaching her terrified her. I never went back. Brenda's book has provided me a much better insite into the disease and has reduced my reluctance to become envolved with someone who has the disease. The chance meeting introduced me to Brenda Avadian where I was able to fully appreciate her strong sense of humor and finite capacity for compassion and understanding. I can only imagine what a toll it must take on a person actively associated with that terrible disease. I was deeply moved by all the patience demostrated by both she and David throughout the tenure of the disease. The strain of seeing a loved one in a diminishing condition accompanied by indifference by other close family members is beyond belief. Thank you Brenda for chronicling your experience in a way the rest of us can understand and appreciate. Tried writing to author with questions and all the messages I wrote all came back saying no such address. Disappointed that I couldn't get in touch with author so I could ask questions. This book is good and tweaks the heart strings, too. The author writes candidly about her experiences in caring for her father. I have shared my opinions with both my daughter and my mother and come away with new thoughts about my clients who have dementia. This book was a great personal perspective about Alzheimer's disease. I could not put the book down until i finished reading it. Brenda did a fantastic job of describing her father's journey with alzheimer's and how she took on the role of his caregiver. My own father went through similar situations with his parents and i wish i had found this book several years ago to see a caregivers perspective and how to better cope with a familiy member with Alzheimer's disease. This book gives caregivers hope that there resources available and others experiencing the same difficult decsions. This is an excellent book with helpful suggestions along with a story of inspiration and true courage.